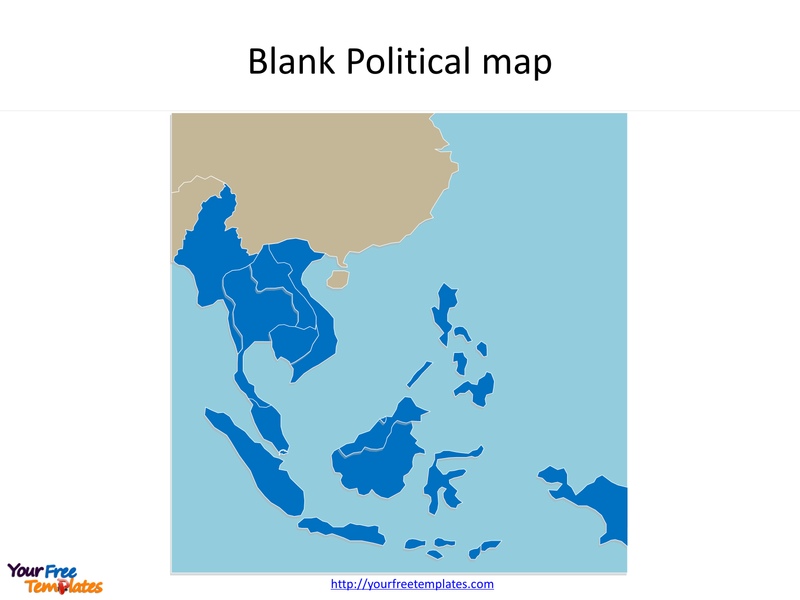 The Map of Southeast Asia Template in PowerPoint format includes three slides, that is, the Southeast Asia map of outline and Southeast Asia map countries. Firstly, our Southeast Asia outline map free templates have major capital cities on it. Secondly, there are 10 countries in our Southeast Asia map PowerPoint templates, highlighting the most important Southeast Asia countries that are Indonesia, Malaysia, Singapore, and Thailand. 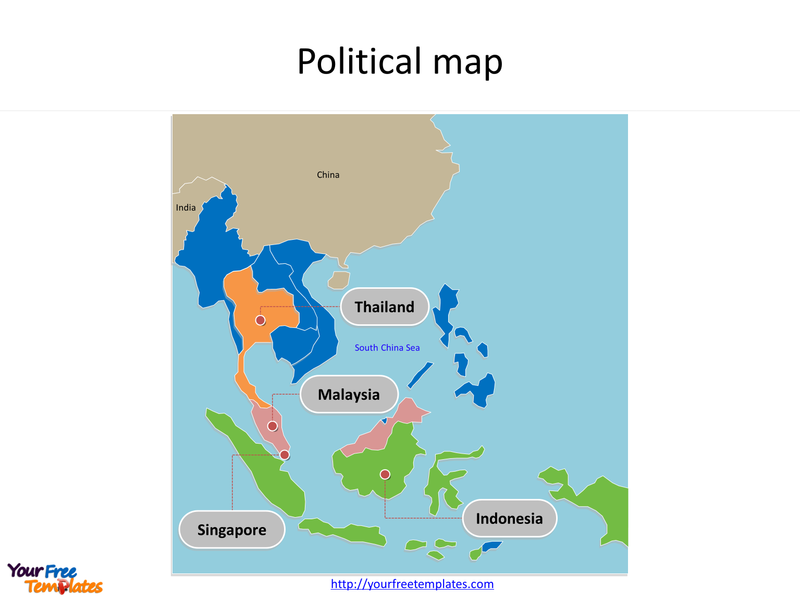 The Southeast Asia Map free templates include three slides. Our Map of Southeast Asia is for Southeastern Asia is a sub region of Asia, consisting of the countries that are geographically south of China, east of India, west of New Guinea and north of Australia. Firstly East Asia is surrounding the sub region from the north. Secondly South Asia and Bay of Bengal are surrounding the sub region from the west. Thirdly Oceania and Pacific Ocean are surrounding Southeast Asia from the east. Finally Australia and Indian Ocean are surrounding Southeast Asia from the south. The major cities in Southeast Asia are including Jakarta, Kuala Lumpur, Singapore, Bangkok, and Hanoi. You can found them in our Southeast Asia map free templates. Slide 2, Map of Southeast Asia free templates with the ten Countries. The Southeast Asia map countries is for the 10 individual Southeast Asia countries. 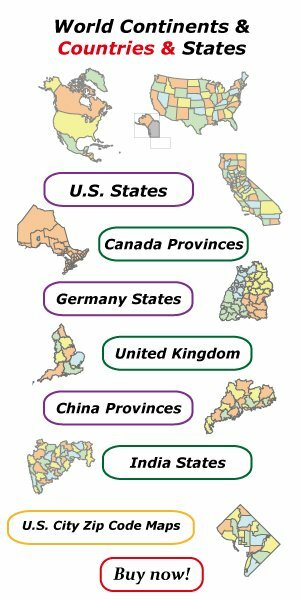 Furthermore each individual country is an editable map. So you can highlight your target countries and add your texts. 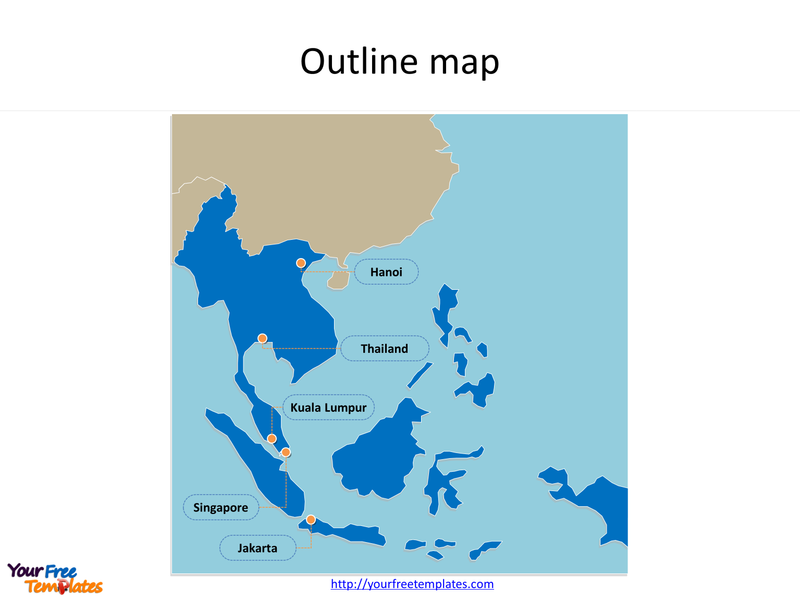 Slide 3, Southeast Asia map labeling with major Southeast Asia Map Countries. It is noted that the Map of Southeast Asia is the country political division of there are 10 countries. Namely, they are Brunei Darussalam, Cambodia, East Timor, Indonesia, Laos, Malaysia, Myanmar, Philippines, Singapore, Thailand, and Vietnam. We selected and highlighted the four most important countries; they are Indonesia, Malaysia, Singapore, and Thailand. What is more, every individual political subdivision is an editable shape. The labels and shapes are grouped by layers. In a word, you can change the texts, colors, sizes, highlight some map shapes, and add your charts. At the same time you can also refer to the fully labeled Map of Southeast Asia in Wikipedia. The most important of all, analysts from marketing research companies, consultants from professional firms think highly of our website yourfreetemplates.com. Because our maps can help them reduce their efforts and create attractive maps.